A fly-on-the-wall narrative of the Oval Office in the wake of the Cuban Missile Crisis, using JFK’s secret White House tapes. On October 28, 1962, Soviet Premier Nikita Khrushchev agreed to remove nuclear missiles from Cuba. Popular history has marked that day as the end of the Cuban Missile Crisis, a seminal moment in American history. As President Kennedy’s secretly recorded White House tapes now reveal, the reality was not so simple. Nuclear missiles were still in Cuba, as were nuclear bombers, short-range missiles, and thousands of Soviet troops. From October 29, Kennedy had to walk a very fine line - push hard enough to get as much nuclear weaponry out of Cuba as possible, yet avoid forcing the volatile Khrushchev into a combative stance. On the domestic front, an election loomed and the press was bristling at White House "news management." 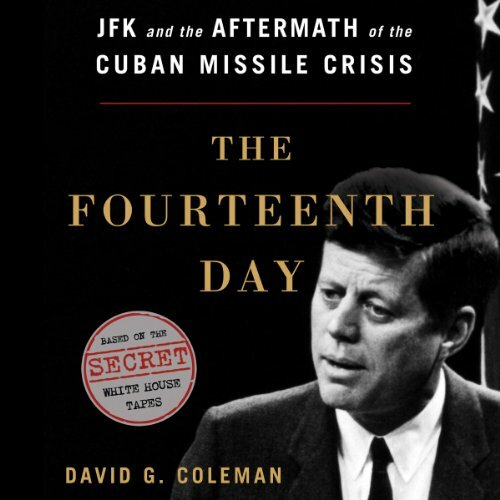 Using new material from the tapes, historian David G. Coleman puts readers in the Oval Office during one of the most highly charged, and in the end most highly regarded, moments in American history. ©2012 The Miller Center of Public Affairs (P)2013 Audible Inc. The dramatic reading style of the narrator was grating and inappropriate for a book of this type. Audiobooks of this type benefit from a more "neutral" and even voiced style. Eliminate the feeble efforts to read quotes in the speaking style of the individual being quoted. For example, quotes of Russian participants came across more as "Boris and Natasha" cartoon imitations that as useful or dramatic additions. Similarly, efforts to mimic the Kennedy speaking style (Cuba/"Cube-er") were weak and distracting. Will be of substantive interest to readers not generally familiar with information in the Kennedy tapes. Not a huge amount of new information/insight for those more generally familiar with the current literature on the crisis.